The name comes from the Spanish word bizcocho used in its diminutive form, biscochito. But there is nothing “diminutive” about these spicy, anise-flavored cookies. They are utterly satisfying, and, like so many delicious treats, loaded with carbs. Their main ingredients are flour, sugar, baking powder, and lard. The history of biscochitos stretches back to Spain, where they are called mantecados, which makes sense, as manteca means lard. They arrived with the conquistadores during the 16th century and were quickly adopted in America under different names, depending on the region. In Cuba, a similar kind of cookie is known as tortica de Moron. Another story about the biscochitos’ origin places it in Mexico. Biscochitos are said to have been baked for the first time after Battle of Puebla in 1862, when the Mexicans overthrew Emperor Maximilian—their victory is celebrated today as Cinco de Mayo. The biscochito, then, became a “commemorative cookie” for the Mexican troops. Traditionally, biscochitos are shaped like a fleur-de-lis, but they can also be cut to look like bells, hearts, stars, ovals, and even chiles. Inspired bakers may even use food coloring to paint them red or green. They are sugared by hand and then dusted with cinnamon. Soft and sweet, biscochitos melt in the mouth and are perfect to dunk in coffee or hot chocolate. In the Southwest, biscochitos reign supreme among holidays’ sweets. They are often offered to the posadistas—the people who participate in Las Posadas, a nine-day celebration that re-enacts Joseph and Mary’s search for lodging in Bethlehem. 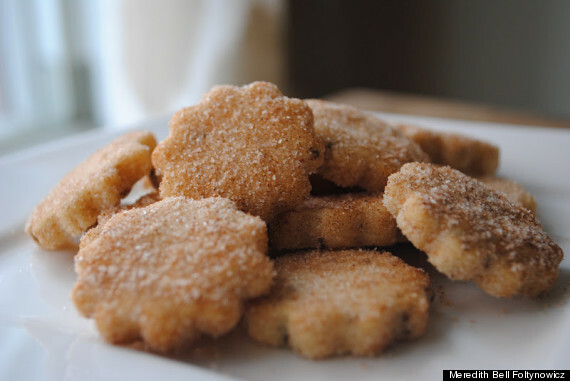 Biscochitos are also served at weddings, quinceañeras, birthdays and graduations. They are all-purpose and all-season treats. Every year in December Taos Herb Company sponsors a biscochito contest. The winner gets a $100 gift card to the store and two runner-ups receive gift bags. Rob Hawley, Taos Herb Company owner, wants to keep the biscochitos tradition alive. He has been running the contest for five years now. There are usually ten judges who take into consideration the cookies’ texture, flavor and appearance to determine the winner. Some come from the Taos County Senior Program, and others, like Robert Graham, are professional bakers. They share a love for all things sweet. Patricia Barela-Rael, a Talpa-based artist and the granddaughter of renowned santero Patrociño Barela, was the winner of last year’s contest.